That was good enough to leave the 2014 Ryder Cup captaincy hopeful tied for 11th, just three strokes behind 22-year old Frenchman Victor Dubuisson, who posted an excellent four under par 68 to grab a two shot lead over Paul Casey, Richie Ramsay, Mark Foster, Jamie Donaldson and local Korean favourite Jung Ji-ho. Up at 4.30am for his 8am tee time, McGinley suffered more than most during what was a physically and mentally gruelling round. But he was understandably delighted that his knee and his game held up to the stress and believes he will soon find into form and play a full schedule for the rest of the season. “No problem,” he said on European Tour Radio when asked about his knee. “I’ve shortened my schedule a little bit at the start of this season and I’ve definitely reaped the benefit with my knee. It’s not under as much stress, that’s for sure. So I have absolutely no problem with my knee. “The biggest challenge I’m having is not physical, it’s mental, getting over that mental battle of trusting it and getting onto my left side. It is [difficult in the wind], but my knee is good. I’m really happy with where it’s at. Paul McGinley plays out of a bunker in the opening round. Photo Jenny Matthews/www.golffile.ieMcGinley was the only member of the five-strong Irish contingent to break par. Gareth Maybin shot a level par 72, Damien McGrane a 73 and Shane Lowry a 74 as recently married Darren Clarke - still on honeymoon from a competitive point of view since winning the Open - finished his day two shots outside the projected cut mark in joint 95th after a disappointing, five over par 77. The Dubliner looked pained at the finish but he confessed he was merely physically fatigued after a tough day at the office. McGinley needs to remain competitive on tour if he is to boost his chances of getting the Ryder Cup captaincy at the start of next year. But as he told the Irish Examiner last weekend, his knee is a problem. “Well, my knees have been an issue for quite a while but they’re not stopping me from playing,” he states. “I’m 45 now and very few guys play their best at that age. It’s been getting progressively tougher over the years. I wake up with pain most mornings, a dull pain, not a sharp pain. Anyone who has arthritis will know exactly what it’s like. It’s bone on bone, there’s no cartilage left, and the knee cap has shrunk quite a bit because it’s been broken so often. Darren Clarke waits for his turn to hit on the 18th. 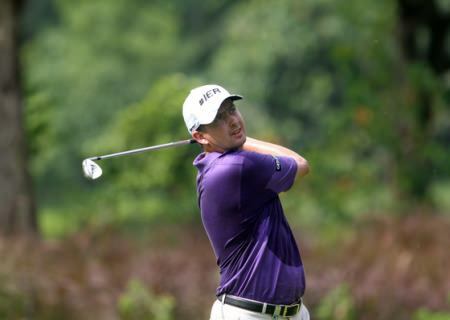 Photo Jenny Matthews/www.golffile.ieMaybin was three under through the turn but dropped three shots on the back nine for his 72 while McGrane, one over with four to play, will be disappointed to have followed birdies at his 15th and 16th holes with two closing bogeys. Lowry got off to another slow start when he bogeyed the par-five first and then double bogeyed the fourth before playing the remainder in one under with bogeys at the sixth and 15th cancelled out by birdies at the fifth, 14th and 18th. Clarke, who has just returned from his wedding in the Bahamas, started on the back nine and went to the turn in two over before dropping three shots in his last five holes. As for the leader, Cannes native Dubuisson drew on his recent experiences playing elite amateur events on windy links courses to put together an impressive 68 featuring a double bogey, two bogeys and eight birdies. “I’ve played a lot of tournaments in England and Scotland the last few years as an amateur, so maybe that’s why when it’s windy, I do okay,” said Dubuisson, who graduated from the Q-School in 2010 and finished 106th in the Race to Dubai in his rookie season. “Last year at the Dunhill Links at St Andrews for example I played well. Most experienced of the chasing pack is unquestionably former Ryder Cup player Paul Casey, looking to add a 12th European Tour title to an already impressive golfing CV. Unlike Dubuisson, Casey was steadiness personified for the majority of his opening 70, his only departures from par being four birdies and two bogeys. Victor Dubuisson leads the Ballantine’s Championship after an opening 68. Picture ©Getty Images“I really feel like my game now is the best I’ve felt so far this season,” said the 34 year old. “I’m still trying to get the comfort level back on the golf course but the good thing is that there’s nothing with the shoulder dislocation that’s holding me back. The shoulder feels great and my body feels wonderful. “In fact, I feel like I’m swinging it back like I did a few years ago, when I played some great golf in 2006 or 2009. I feel like the freedom is coming back but I just need to sharpen it up. “I’ve been playing some good golf over the last couple of weeks but have just been making too many mistakes and that’s what I’ve got to put right. That requires playing more competitive rounds of golf and just getting that edge back, because you can’t compete out here unless you have that edge. Alongside Casey, the most impressive golf of the immediate chasing pack was played by another man confident in the wind having grown up in the north east of Scotland, Aberdeen’s Richie Ramsay. The 28 year old Scot has the misfortune of carding a double bogey seven at the fifth following a fluffed chip, but elsewhere he was impressive as five birdies helped him into contention. “It was quite cold this morning when we teed off but I played nicely in parts,” said the winner of the 2010 South African Open Championship on The European Tour. “I was a bit scrappy in parts, but to be honest, I putted beautifully on these greens which are really, really nice. All in all it was a good day. Adam Scott drives on the 18th on day one of the Ballantine’s Championship. Photo Jenny Matthews/www.golffile.ie“I played well last week in China last week, but I think this is a course that suits me more. You have to hit some really good tee shots out there with the wind, and it’s playing a little bit firmer. There’s a few bounces in there, so you’ve got to be quite accurate with your irons. Eleven players finished their opening rounds on one under par 71 including one of the pre-tournament tips Adam Scott, although the World Number 12 looked far from favourite material after a disappointing start to his round which saw him card a double bogey sixth at the tenth as well as a bogey five at the 12th. But as the weather warmed up, so did the Australian and he recovered manfully, including making birdie three at the testing ninth hole – his final hole of the day – to fire himself right back into contention for the €2.2 million Championship. Fading light, at the end of the day, meant the first round proper was not completed, with two matches required to return at 7.30am on Friday morning to finish up. The second round will begin, however, as scheduled at 7.00am.